What is amazing to me is that most classrooms and even some virtual learning spaces are still designed with a type of learning in mind that is constrained, fixed and teacher-driven. That is, most classrooms still suffer from what I call "the fireplace" syndrome in which something has to be fixed to a wall (a blackboard, a white board, a projection screen, a smart board, etc.) and usually fronted by some sort of teacher desk or podium. This can also be the case virtually according to how the design and flow of content and interaction takes place for the student and who controls the access to course content and instructional choice. In a "fixed" instructional setting, the expectations are clear, and students all know which way to face and from which location/source information and instructions will flow. The remainder of the seating or online responses take place accordingly with no allowance for flexibility or the kind of multilayered instruction that is currently possible through the technology now available to us. Granted, some colleges and universities have more technology budget than others, but new technology has been with us long enough for teachers, even in those kinds of limited situations, to be experimental and experiential (as in the Dewey sense) with the learning environments. For those teachers who do have access to a technology budget, why are their teaching spaces still so reminiscent of the past? Why are these spaces still so fixed while students are being encouraged to use technology that is not fixed but is mobile? And when everyone is being challenged to do more with less, why do we not see more multipurpose learning spaces, particularly in physical buildings where space is often limited? Never before has it been more possible for educators to put instruction front and center of learning space design (i.e. physical classrooms and virtual spaces) than now. Never before has collaboration with students and peers and with the world been more possible than now. Yet we still educate with strict control of space. It seems ridiculous even to think of learning spaces as confined now that students can connect with the world and glean content from everywhere. Teachers are a vital part of the process, of course, but only one part. There are literally masses of information available on any subject area along with direct communication, real and asynchronous, with just about anyone anywhere in the world where there is Internet access. So why are students still taught with a sense of restrictions? Of course, some forms of testing still demand a certainty of information, but that surely should be the starting rather than the ending point. As educators, we don't want to focus on developing test takers and rote repeaters of information; we aim to develop individuals who can think for themselves, find new information, work with others toward a unified goal, and utilize all resources available to them in their endeavors. Self-directed student access to resources outside of the class session. For instruction to move front and center of the process, teachers should walk into (physically and virtually) any learning space as a collaborator in that environment, aware that learning must take place, and thinking about connection and networking rather than lecture and silence. Additionally, if instruction were really to become front and center of learning space design, students would be as responsible as the instructor or the school janitor for how the room is set up based on the work that is to take place rather than the work that was to take place yesterday, last week, or back on the 1950s. Teachers and students would not know exactly where the process would go but would be excited to be involved together in such a constructive endeavor. Classroom or learning space management (or control) becomes less of a focus than learning management and facilitation. So what does the physical or virtual set up of learning space have to do with students feeling empowered and involved? The reality is that environments are important when it comes to influencing perceptions and expectations (Nancy Van Note Chism, Deborah J. Bickford, 2002). Support for research and service, as well as for teaching. Increase rather than decrease mobility. In regular space setup, we instinctively know that the "fireplace" is set in place for a reason, and we need to pay attention to that location, since it's from that location that all important information will flow. This illustrates the conventional classroom setup most general classrooms use. The instructor/podium and the fixed board direct the students' attention and also make it more difficult for the instructor to move that attention beyond those confines. In this conventional scenario, instructors must organize students into pairs or groups for heightened interactivity and report back to the whole class, although, essentially, students remain individualized in the learning context. Usually, these "instructor-centered" distributions depend on the instructor for all interactivity and distribution of work. Additionally, in this scenario, students are less likely to become autonomous and self-directed learners (a vital focus in all education) and remain dependent on their instructor to provide next steps and needed information. Teachers, then, who are interested in developing autonomous critical thinkers have to work extra hard to change those perceptions and create more collaborative environments in order to increase interaction. Once the learning time has ended, however, the space is placed back in the regular format, and students "settle down" into the usual flow of things. With new technology, students can be connected anytime and anywhere, and any space can become a learning environment. 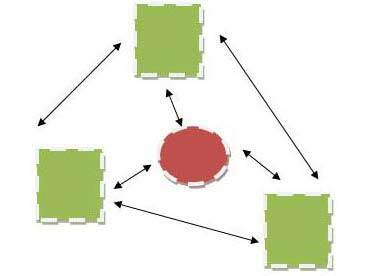 So a formal structure is unnecessary, and meeting points, points of input, connection points, and application points become more important. 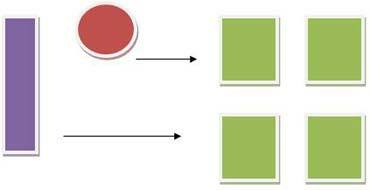 Each of these elements is outlined with a dotted line to illustrate its flexibility of position. There is no preset focus here on a board or a teacher but on the entire class as a community of learners. Also, learning stations are supportive of autonomous learning within a collective group as each student is also networked and wirelessly connected to the next. Additionally, the arrows are double-faced to illustrate that the flow is reciprocal and is as dependent upon student input as content or instructor input. Added to this, the interaction can now be captured and distributed beyond each class meeting and is accessible to students for further work and discussion outside of class. I have coined the phrase "free design" to capture the idea that learning spaces should not be constrained anymore but be free to support the learning that is taking place and be unconstrained and flexible in time and connectivity so that various groupings, learning partners, and projects can be configured and facilitated within one class setting. Additionally, those connections become driven by need rather than preset by the teacher. Therefore nothing is fixed, but everything is moveable and open. Nothing is teacher-controlled, but everything is open to student participation and involvement. Everything is wireless and moveable. Desks are moveable. Projections screens are on every wall surface. Computers are fully networked and not teacher-controlled. Learning is captured and distributed beyond the time it took place so that it can be continually accessed and built upon by other students, even in other classes. Free design means that not only is instruction first, but perceptions are not influenced in any preset manner but are totally open to the influence of the learning process and the dynamics of direct communication and interaction. So while we are implementing more new technologies that are flexible and mobile, it is important for us to examine the learning spaces within which students use that technology. Do we seem to be conflicted or caught between two worlds? As long as we retain the idea that the flow of information is from the teacher while students are the receivers of this information, we will never maximize the potential of new technology that can support students being front and center of the process and continuous participants in their own and the collaborative learning of the group. Teachers must begin to really understand that learning can now be continuous and without boundaries, and learning environments should look like we believe it. Blackett, A., and Stanfield, B. "A Planner's Guide to Tomorrow's Classrooms," Planning for Higher Education, Spring 1994, 22, 25-31. Jilk, B. A. "Designing a Model for the College Campus of the Future," AI Architect, Apr. 1998.